HOTEL TRANSYLVANIA 3: SUMMER VACATION is now in theaters everywhere! 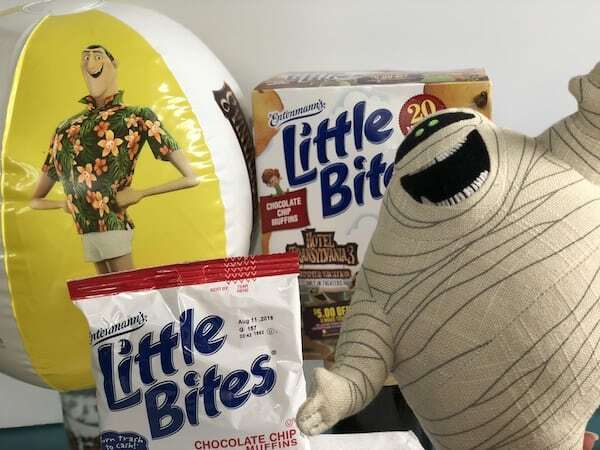 To celebrate in collaboration with Sony Pictures Animation, Entenmann’s® is has launched a frightfully fun promotion. Entenmann’s® also makes a variety of delicious, cake style donuts such as fan favorites like Rich Frosted, Crumb and Powdered. The rich frosted are like my favorite of all time – the chocolate is so good! During the busy summer months when we are off to the pool, to the park, or just running errands around town, Entenmann’s Little Bites make an easy on-the-go snack that’s always a treat! 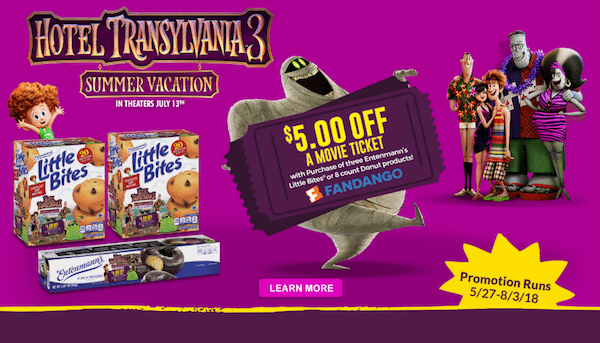 Now through August 3, 2018, you can receive $5.00 off a movie ticket to see HOTEL TRANSYLVANIA 3: SUMMER VACATION with the purchase of three five-count specially marked Entenmann’s® Little Bites® or eight-count specially marked Entenmann’s® Donuts. For more information about the movie ticket promotion and to access fun – and free! 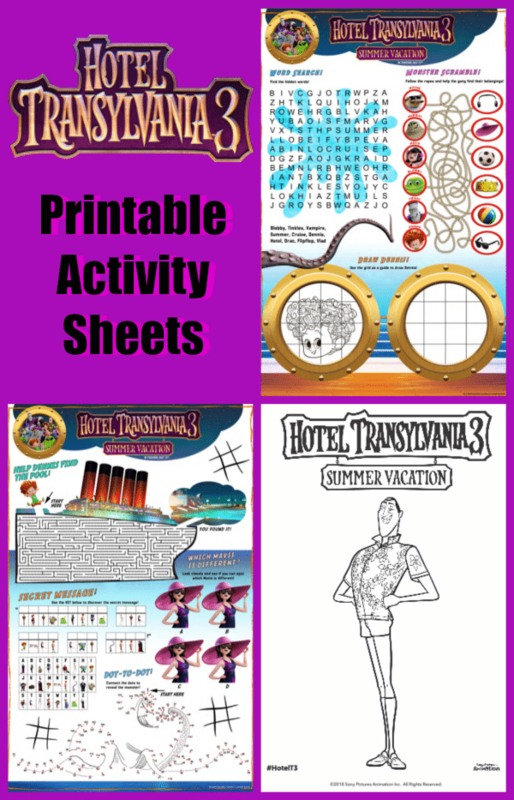 – Hotel Transylvania 3: Summer Vacation activities and more, and to redeem the promotional offer, please visit https://www.littlebites.com/hotel-transylvania-3. One lucky Thrifty Jinxy reader will receive a $25 virtual Visa gift card and (3) coupons for $7.00 off the purchase of any Entenmann’s® products! To enter, just complete the entry form below by 11:59pm ET on 7/27/18. Good luck! We Can’t wait to this movie! We are Adam Sandler obsessed at our house! We like to have little bites for breakfast in the morning. My kids will definately have Entenmann’s Little Bites after dinner as a snack. My son loves Entenmanns little muffins. I like them too. Usually as a snack when we’re on the go or in my kids lunchs. I don’t have kids, but I do like the Strawberry Yogurt Muffins. We love to snack on Little Bites when we travel and when we go to the zoo and the park. Love to snack on Brownie Little Bites, so scrumptious with a tall glass of milk. We love to snack on Entenmann’s Little Bites as an afternoon snack and before bed snack! We like to snack on Entenmann’s Little Bites in the mornings and in the evening as a snack. We also can’t wait to see Hotel Hotel Transylvania 3 super excited about this movie! These are great to snack on at the park. My kids would snack on these anytime of the day. My boys are 20 and 21 years old, so they eat a lot and often. They eat these in class, in their dorm and now that they are home for the summer, they eat at home. My husband actually thought Hotel Transylvania was a cute movie so I think he’d like to see this as well. Entenmann’s Little Bites are so good. We buy them every week! I don’t have kids, but I do like the Brownie Little Bites. My son likes these in his lunchbox. It’s a good mid-afternoon snack. I usually snack on Entemann’s Little Bites during the mid morning hours. I am looking forward to taking my nephew to watch this movie. I look forward to seeing this with my whole family! My child loves snacking on Entenmann Little Bites. I saw Hotel Transylvania 1 & 2 on tv a month or two ago, and I liked them a lot more than I’d thought I would, so the third one should be a lot of fun, too! We’re looking forward to the third movie because we loved the first two movies. My son would most likely snack on Little Bites between lunch and dinner. Little bites make great snacks in between meals and after school! We love to eat these at the park, thank you so much! 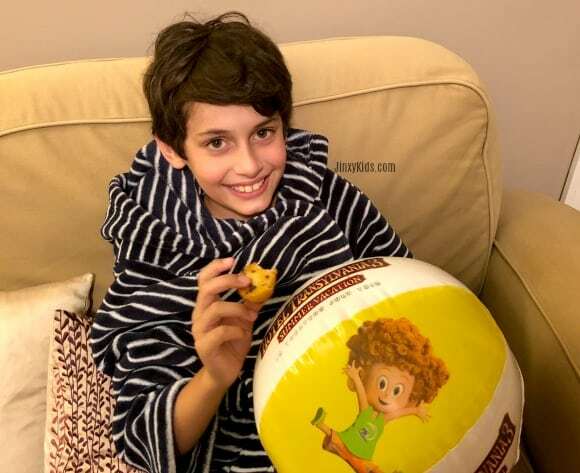 We love to snack on little bites muffins for afternoon snack – especially after school for my grandsons! We like to snack on them for breakfast, or to take them for snacks or packed in lunches. I like to share fun snacks when I babysit my nieces. They would enjoy these. Little Bites would make a great afternoon snack. I’m excited because I loved the other movies! My kids like to snack on Entenmann’s and for a quick breakfast. We have seen all of Hotel Transylania movies. We would love to see the new one. We can’t wait for Hotel Transylvania. We like to snack on these on the go! Thanks for the chance to win! we loved the 1st 2 movies and would love to see the rd. We love Little bites. they are perfect at home for a snack or on the go. We loved HT 1 and 2 and can not wait to go and see 3. We saw Translyvania 3 on Friday! It was so cute. The kids will create a reason to eat Entenmanns snacks – amazing reasons – and always with a smile. As for the movie, we are all excited to see fun movies as a family. I’m looking forward to seeing the movie because my kids think it’s funny and it will make them happy. I like to have them in the afternoon as a mid day snack. We really liked the first two movies and so we were excited to see Hotel Transylvania 3 this morning. It was really cute! My whole family loves the Hotel Transylvania movies! They are so cute and fun. We would love these for dessert! Already saw it. It was fun. We would like to snack on these when we watch movies in the evening. My girl loves to snack on these ANYTIME they are in the house!! We would definitely snack on them while watching Hotel Transylvania 3!! I am going to watch the movie. The first two were very funny. The crumb cake entenmenns is great with morning coffee especially on a sunday. Looking forward to taking my grandsons to see the movie. We saw #1 and #2, and really enjoyed them – hoping this one is good too! It’s a perfect – after school-do-you-homework snack. When we want something sweet. When we go to the park. I would say a mid morning snack ideal for us. Or any time they are great! We take LIttle Bites when we go to the lakes and when we go boating they are perfect for that. they love these as a after dinner snack. I most like to snack on Entenmann’s Little Bites in the morning. Thanks for the giveaway! I thought the first movies were entertaining. Let’s see how the next movie rates. My boys and I love eating little bites in the morning before school in the car. We love them!!!! OH MY, A MID AFTERNOON SNACK IS THE IDEAL TIME FOR LITTLE BITES! afternoon snack and road trip snacks! My kids like to grab little bites on the way to their bus stop. Quick and easy breakfast. we liked the 1st 2 movies and this one looks good too! We like to use these for school lunches. I like to bring Little Bites to work. We like packing them for picnic lunches! We like to eat them as a snack in the car. We like to eat it them as a quick breakfast. I buy and hide these for treats when my gkids visit. Love those chocolate chip mini muffins. What a fun movie. I cannot wait to see it. We love chocolate chip Little Bites. They are the perfect snack. My family and I most like to snack on Entenmann’s Little Bites at breakfast time. I like any snacks that are only a bite or two, allows for a small indulgence. We love little bites as a pool time snack. We like Little Bites as a snack at the park! We love to take Little Bites Muffins along on car trips..so convenient and delicious! I think my kids would most like to snack on Entenmann’s Little Bites® for an after school snack. The new movie Hotel Transylvania 3 looks good. I think my daughter would enjoy it. We love the Little Bites muffins for a quick breakfast! My two boys are always wanting a snack in the afternoon. I think they would like these muffins along with a glass of milk. I like having Little Bites as a dessert after lunch or dinner. we have already seen the first 2 so we are really looking forward to ths one. It looks really good! we like to eat the little bites when we go on car trips they are easy to pack and the kids like the sugar rush they get. we are all excited to see the movie too. My kids and I wish we had some Entenmann’s little bites right now. They would love to watch the movie while eating them for sure. In the afternoon for a quick afternoon snack. I love these little mini muffins on busy mornings, (and let’s face it, what morning ISN’T hectic?!) I do also want to see Hotel Transylvania 3. I’ve loved the first two and I’m positive this one won’t disappoint. They’re very original and laugh out loud funny. We love the Hotel Transylvania series. I’m sure this new one will be no different. These bites would be great for a mid-morning snack. My kids like to eat this with breakfast. We would snack on Entenmann’s Little Bites when we are playing at the park. We like grabbing these as a quick breakfast snack when we don’t have time for a full breakfast! My kids love to eat these during their afternoon snack. I love to take Little Bites on the go since they are so easy to put in my purse or in the car. Little Bites are a great on-the-go snack. My niece takes them in her school lunches. I would love to see it because it looks like a super cute movie. I carry these with me as easy on-the-go snacks. We loved the first two movies. Blobby is hilarious! My kids would love to snack on the blueberry muffin bites! Thank you for the chance! I love to have Little Bites in the morning with my coffee. The Blueberry Muffin is my favorite. Looking forward to the new Hotel movie! My kids and I would like these anytime! We like to have Little Bites for breakfast for after school snacks and for school lunches. My granddaughter can’t wait to see Hotel Transylvania. The kids I nanny are most likely to eat Little Bites after lunch, and I’m most likely to eat them after work. We like to have them for a mid mornig snack. Thanks for the chance to win! Hotel Transylvania 3 promises hilarious frights! We enjoyed watching this movie two weeks ago. We eat these as a mid morning snack. We all snack on these basically, as soon as we buy them! LOL They sure don’t last long and they are oh so yummy! I know Carter would love this movie. We really need to get him to the movies again soon. 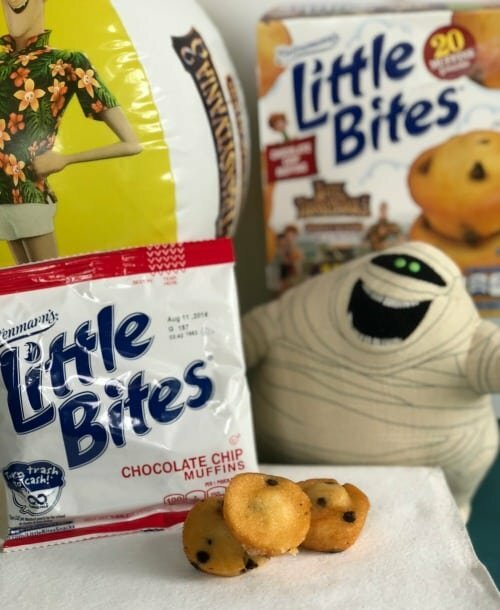 My family loves the blueberry bites and we CAN’T wait to see Hotel Transylvania 3 !!! I like to snack on these around lunch time. I like to have these for dessert. My kids would snack on these all day long. My kids would eat the muffin bites as a snack at home or school. I love Entenmann’s Littl;e Bites. We went to see this movie on Tuesday evening. It was so fun! We will definitely be getting it on DVD when it comes out, and my oldest daughter wants to see it in the theater again! We even took some Entenmanns brownie bites to the theater for a snack for my girls. My sons snack on brownie bites at night, It’s on of their favorites. My kids would eat these anytime while on their ipads. I would love to eat the muffins as an on the go snack! The first two movies were great. The previews for Hotel Transylvania 3 look even better! We would eat them at any time of the day or night. After school; and we get to view Selena Gomez as Mavis again! My son likes to take it in his school lunch. I probably will not be watching the movie but I LOVE Entemann’s little bites!!! My kids would like to snack on them anytime. I’ve already seen it. It s a great movie. My kids will eat Entenmanns Little Bites anytime they can get them, they love them and so do I. My kids like them for breakfast or just for a snack! We would snack on them after lunch! We love the first 2 hotel transylvanias! My kids always enjoy Entemann’s after school the most! They seem to have an insatiable hunger at 3:30! My kids and I would enjoy these while watching a movie. We’re excited to see Transylvania 3 because we really enjoyed the first two. The kids like to have Little Bites as a sweet afternoon snack treat. My kids loved the first 2 movies, so I’m sure they’ll love this one too! For an after supper or midday snack. My kids love to have the blueberry Little Bites after school as a snack! My grandchildren like the Little Bites any time they can get their hands on them! My kids love to snack in the afternoon! I just purchased Hotel Transylvania 1 & 2 on DVD and am planning on watching them with my nephew this weekend. If they are as good as I think they are, then I can’t wait to see Hotel Transylvania 3 as well. Mine would like them as an afternoon snack. 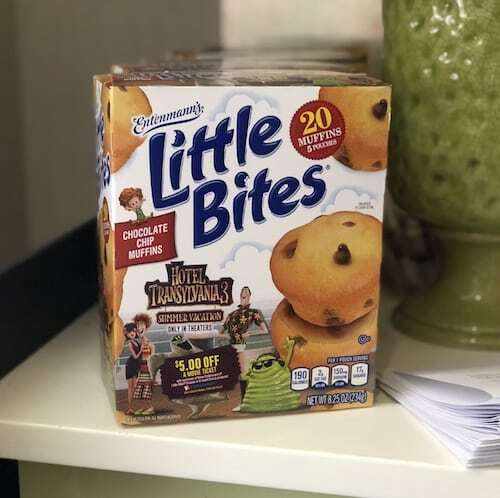 My kids would love these for an after school snack for sure..
We like to eat Entenmanns Little bites blueberry muffins as a before bedtime snack. Looking forward to seeing Hotel Transylvania 3 with my son! I’d like to snack on them in the afternoon. We like the blueberry muffins. I want to see it with my kids! We love packing snacks and going out on the lake fishing. Perfect time to enjoy Entenmanns Little Bites! We all like to snack on them in the evening and also for breakfast. I would love to snack on them after lunch! We like them in the morning, or midday snack or after dinner for dessert …heck we like them all the time!! My grandson really wants to see the movie too! We would eat Little Bites for breakfast. Our kids like to snack on Entenmann’s Little Bites after swim practice ! Entenmann’s Little Bites look amazing love them anytime were watching a movie or out at the park. We like to snack on the chocolate chip version. I most like to snack on Entenmann’s while watching a movie on TV.